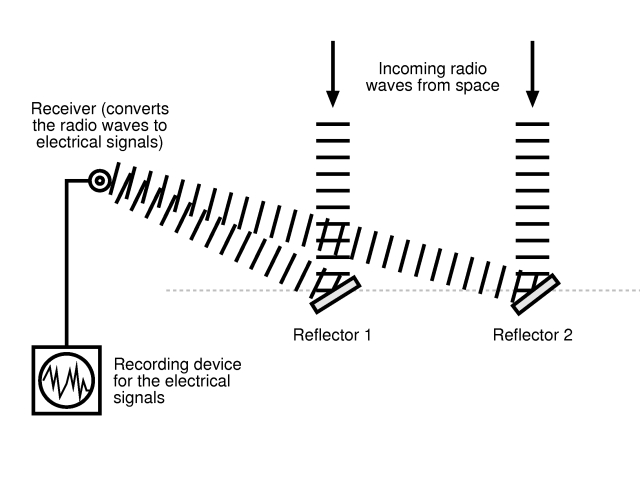 Now let’s imagine that we have a radio receiver that converts radio waves into electrical signals. 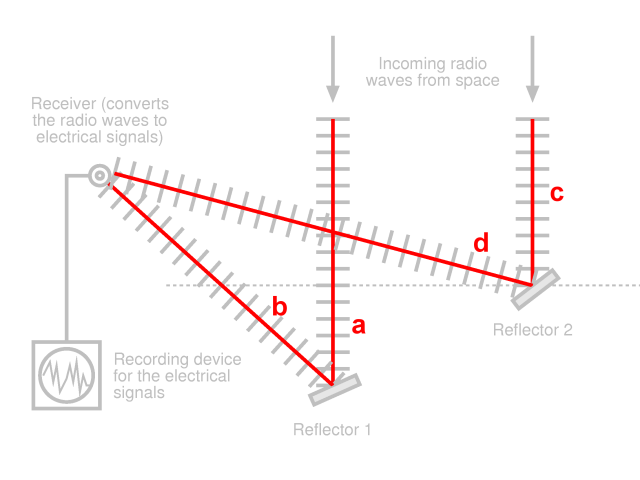 If there is a certain strength of signal, then it generates a certain electrical output. To improve the sensitivity, we can amplify the electrical output. But that can only improve things so far. As the amplifier is turned up, it amplifies not only the signal, but also any noise in the system, which limits how much this can be done. So instead, we need to somehow increase the power of the incoming radio signal. One way to do this is to collect more signal in the first place. 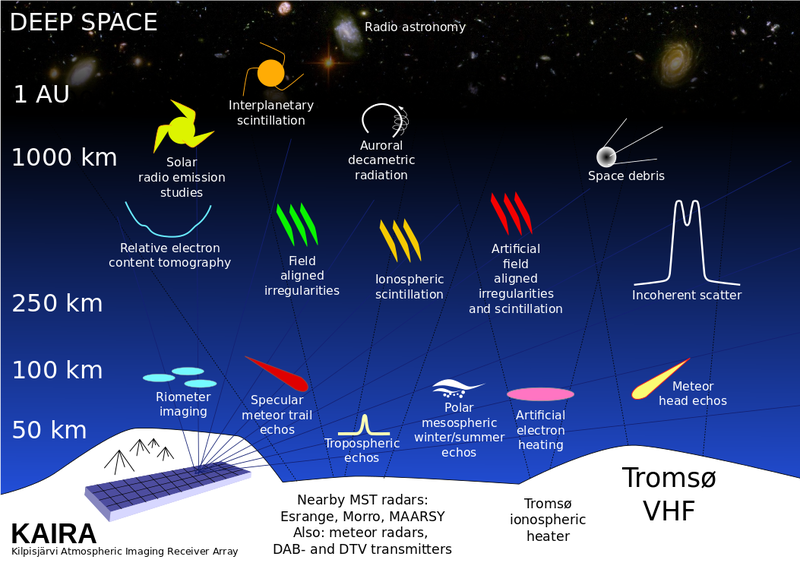 Let’s say we have a radio receiver, which is picking up signals from space. 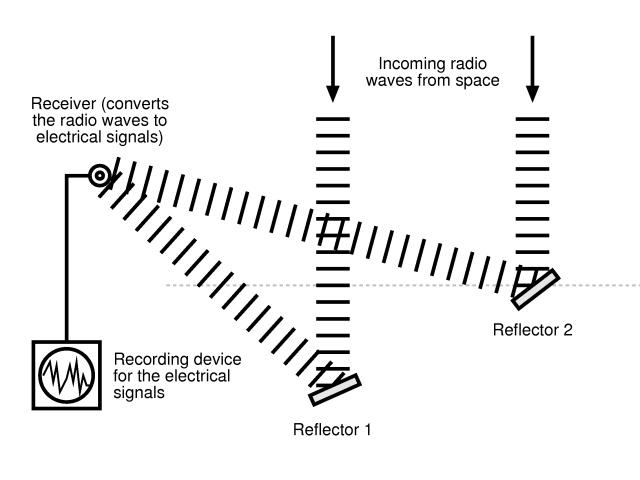 To get more of that signal into the radio receiver, we could take a reflector (say a sheet of metal) and bounce some signal onto the receiver. 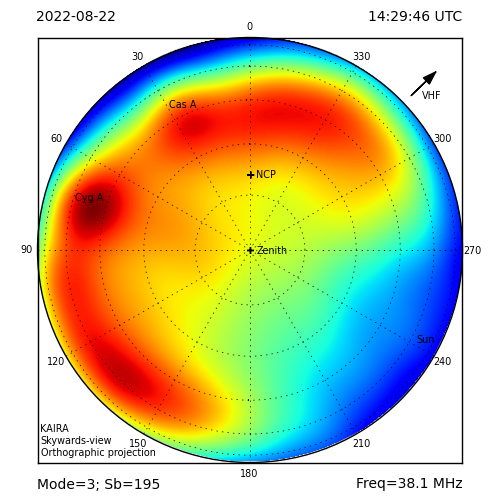 Then, we could add a second reflector and bounce in some more signal; effectively doubling the amount of radio waves that are received. This is fine, but in order for this to work well, the signals should optimally be added in phase. Because Reflector 1 is closer to the receiver than Reflector 2, the waves it is reflecting arrive at the receiver first. Because the two signals do not arrive together, they are out of phase and reduce the final result. 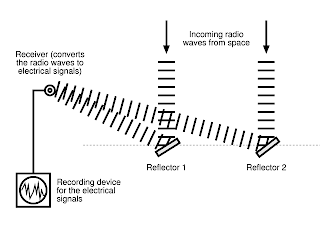 To get them to add “in phase”, we must somehow delay the signal from Reflector 1. The easy way to do this is to put the reflector a bit further back. 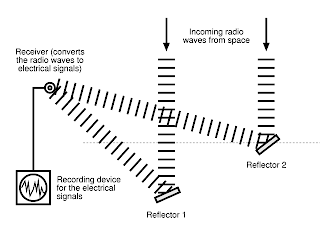 That way it takes longer to get the reflector in the first place, to compensate for the fact that it has less to travel from the reflector to the receiver.